When Anthony E. Zuiker Creator, CSI: Crime Scene Investigation, (in picture above with Philip Rosedale, CEO Linden Lab), CSI: Miami, CSI: NY delivered his keynote at Virtual Worlds Conference and Expo in San Jose last week, I felt I was listening to the world class player who would be the first big winner of the virtual world’s e-jackpot. As a finale Zuiker dressed as Santa Claus and threw Snickers bars out to the audience to remind us that this is a time to celebrate and think about a sweet future – the convergence of virtual worlds, television, gaming, mobile and the web in delicious mash-ups like chocolate and nuts. But even without this jolly and tasty reminder, I doubt if anyone had missed the point. It is clear that Zuiker has drilled deep into what it means to accomplish this convergence. This is no testing the waters of virtual worlds by a naive and timid giant from old media. Zuiker’s intimacy with everything it will take to accomplish this revolution from story telling, to gaming, to television, to social networking, to user generated content in virtual worlds is apparent. 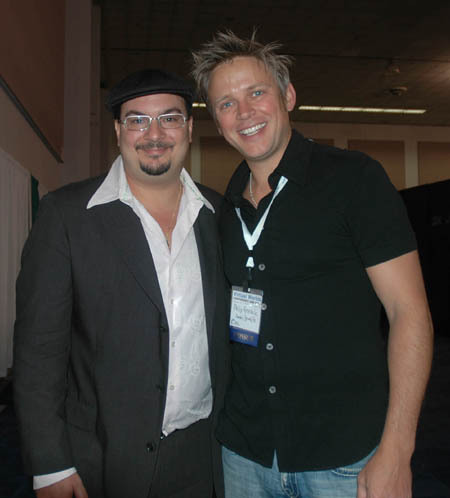 In my exclusive interview with Anthony Zuiker (later in this post) you will hear a precise articulation of his vision. 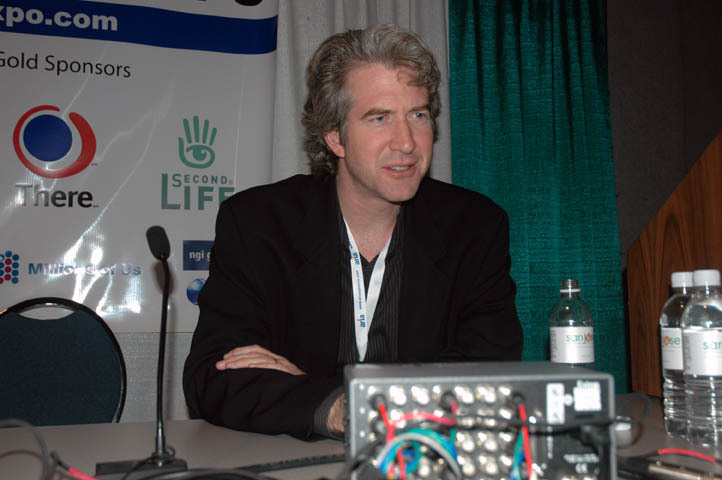 The body of this post is interviews with four key players in the convergence of CSI and Second Life – Anthony Zuiker, creator of the CSI franchise, Sibley Verbeck the CEO of The Electric Sheep Company, Philip Rosedale CEO of Linden Lab and Chris Carella, Chief Creative Officer, The Electric Sheep Company. On October 24th the CSI: New York story line will be taken into Second Life (check this promo out – definitely revved up but very true to the experience of Second Life). The Electric Sheep Company have gone to great lengths to prepare Second Life for the mainstream including the launch of a new viewer that will premier with CSI. I asked Philip Rosedale for his thoughts on the CSI adventure. I think it is a great project. We don’t look for traffic for Second Life in general we more look for opportunities to present Second Life to people in a more obvious way to people who don’t understand it, or haven’t experienced it. And when I heard about the CSI plan roughly in terms of what they wanted to do with the show I really thought that it was something we should support. It felt like a fair and appealing presentation of Second Life and something that would get a lot of people intrigued in a way that it was difficult to do on the web site. I’m looking forward to it. I think it will probably overload all the systems associated with it but that will be a test. The Virtual Worlds Conference and Expo 2007 has been blogged by Eightbar, Crave, Mercury News, Metaversed, Mindblizzard here, here, here, and here, Out To Pasture, Raph Koster (on interoperability) SLNN, here, here, Virtual Worlds News, Vintfalken, Virtually Blind, Games On Deck (on mobile virtual worlds), ClickZ (picture of the mocap here), Joipodgorny, FT Tech Blog, The Entrepreneurs Guide to Second Life, The Hollywood Reporter, theage.com.au, Smart Economy, PC World (nice picture here from CSI Second Life spoiler of Sinise standing in front of his Second Life avatar), CNET news.com, A Media Circus, so you have an opportunity to see some of the many strands of the conference as well as more on the show stopper start from a variety of view points. This amazing collection of links is thanks to Malburns Twitter stream. The conference was so rich and mutli-stranded it is impossible to cover all aspects of it. Fortunately the top notch team of Virtual World’s Management, headed up by Christopher Sherman, is making MP3s of the whole event available. I will be posting an exclusive Ugotrade interview with HiPiHi Founder and CEO Xu Hui in my next post. 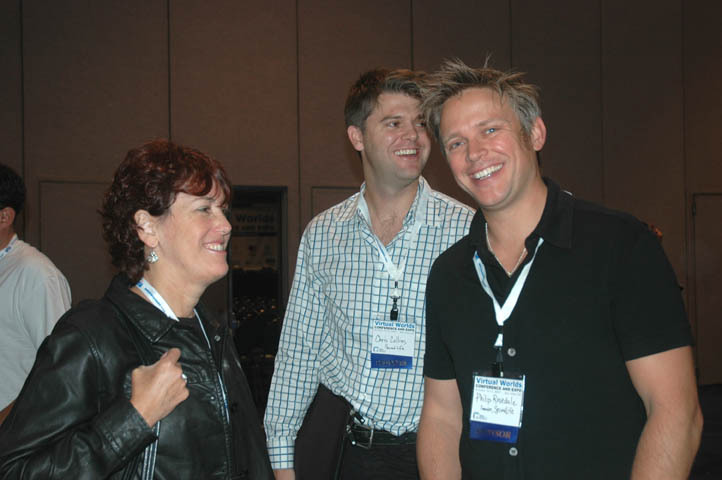 With the great visionary speaker for the role of virtual worlds in a creating a better planet Philip Rosedale in the audience (a role Philip really seemed to enjoy! ), it was Xu Hui who notably stepped up to the plate and spoke out for virtual worlds as the highway to positive global development. 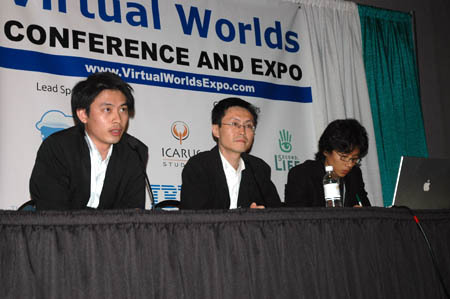 There is an excellent report on Xu Hui’s presentation on the Virtual Worlds in China panel on the Virtual Worlds News blog. Blake Lewin, VP Product Development, Turner Broadcasting Inc., stopped by to chat with members of the HiPiHi team after the Visionary Panel. Raph Koster on the right shakes hands with someone off screen. Things did get a little snippy on the Visionary Panel. Kaneva, Areae, Makena, HiPiHi, Microsoft’s Virtual Earth, and The Multiverse Network were all represented and in fine form. But disagreement erupted (a polite war of the worlds) around the role of 3D in the future of online social networking/gaming environments. 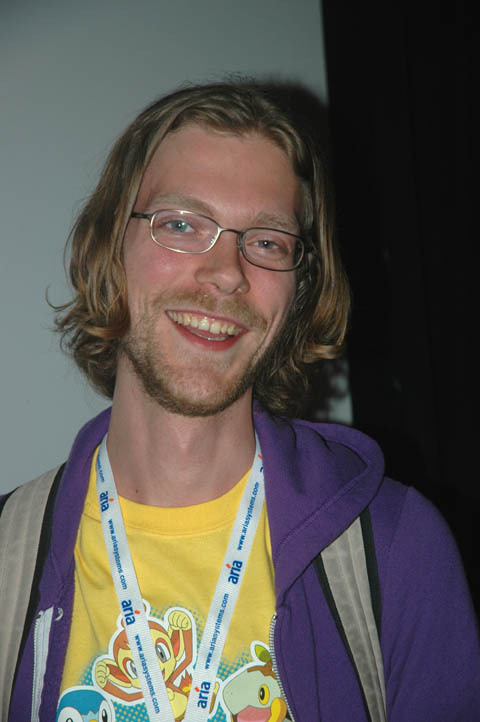 Raph Koster creator of Metaplace gamely and very convincingly challenged the absolute preeminence of 3D. 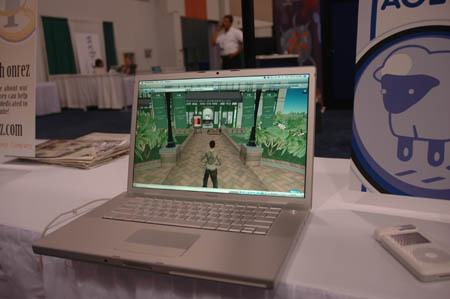 But, in my view, at this conference at least, the potential of the open and rich immersive 3D environments exemplified by Second Life and HiPiHi stole the show. Will HiPiHi and Second Life come together in the future? Yes, maybe a partner. 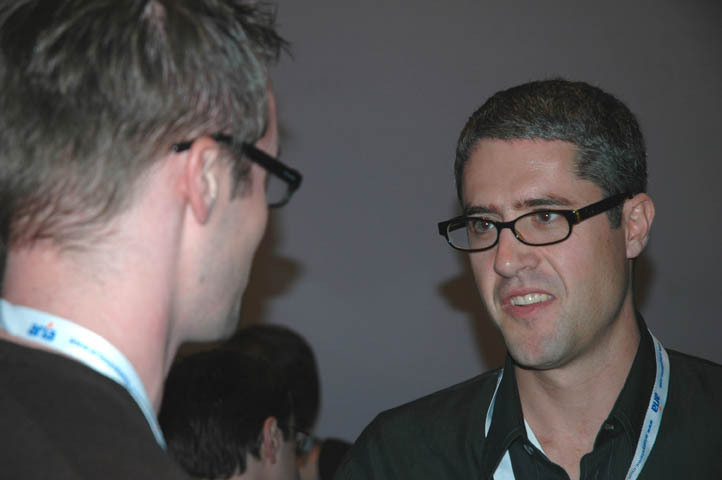 We have a lot of similarity with Second Life and especially when we talked with Philip. We think that in the future that we are working together for the growth of virtual worlds. Virtual Worlds and Television – A Revolutionary Convergence. I wish I had a more immersive way than this blog to share some of the excitement of the Virtual Worlds Conference and Expo in San Jose last week. The billion dollar questions at the heart of the conference were the hows, whats and whys of the transition of virtual worlds from a “boutique” phenomena to the mainstream. Christian Renaud gave an excellent overview of this in his keynote. 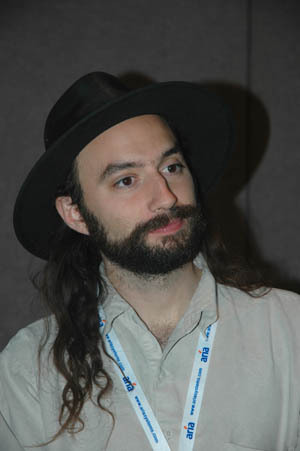 There are several posts commenting on his presentation including worldsinmotion, virtualworldsnews, mindblizzard, gamasutra, and a Keynote Shorthand on the Cisco Virtual Worlds blog. While the message that “Chrismas is a coming and …….” was clear in Zuiker’s keynote. There was also a bit of spring fever in the air. Match making was going on everywhere. Omnicom has acquired a stake in Millions of Us and HiPiHi is partnering with MoU. The Electric Sheep are taking an equity stake in a new children’s virtual world, Star In Me. These are just a few of the notable examples. Like Electric Sheep, Millions of Us has a deep portfolio of partnerships now including some very interesting new faces like SceneCaster. And while Rivers Run Red did not come to San Jose I am expecting them to roll out some interesting news at The Virtual Worlds Forum in London next week. Reuben Steiger, CEO of Millions of Us showed some awesome films made in Second Life that take Scion City into new territory. Reuben very eloquently explained why the evolution of television into virtual worlds would not only be the killer app for Second Life but a revolution for television. 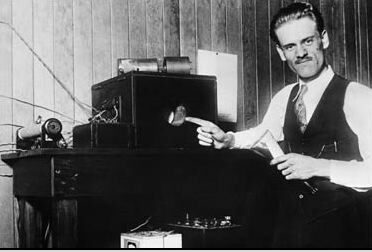 Reuben presented a wonderful image of the connection between Philip Rosedale’s pioneering genius and that of the brilliant young inventor of television Philo Farnsworth. 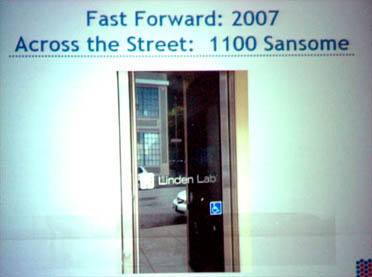 The picture above shows the door to Linden Lab reflecting an image of the building that now stands on the site of Farnsworth’s original 202 Green Street laboratory. Two major advances in television were announced yesterday by a young inventor who has been quietly working away in his laboratory in San Francisco and has evolved a system of television basically different from any system yet in operation. It wouldn’t take much editing to use the same words to describe the recent innovations of Second Life. After listening to Anthony Zuiker’s great convergence plan and watching the intriguing spoilers for CSI in Second Life produced by the Electric Sheep Company and the fabulous clips from Millions of Us. It was hard not to start thinking that the convergence of film and television with virtual worlds will be the game changer. Me: I was impressed that you were ready for the adventure of integrating mainstream TV into an open user-generated virtual world like Second Life. Could you tell me about that? Anthony Zuiker: Yes sure. I think I understand the future of television is going to be highly interactive and going to utilize multiple platforms. And in doing that when the opportunity arose to be able to tell a narrative story in first life meaning on air and to continue that narrative into Second Life meaning on-line and a 3D experience it was just perfectly made for CSI: New York. The future of television, in my opinion, really is television, on-line, mobile and gaming. The days of sitting in front of your television at a specific time to watch really have come and gone. And I believe that the viewer wants a deeper experience in other platforms we are very device driven at this juncture and if we can continue the story line and give entertainment that is specific to the devices, specific to TV, specific to the web, specific to mobile, specific to gaming. I believe that you will live in a world where you can win this fight two ways. One you can do a great TV show and deepen the experience across platforms and when the TV show continues drive people back to television and never ever miss a beat. So if you actually are watching and you only watching TV you won’t be behind but if you go for the deeper cross platform experience it will be a deeper experience but you are also not ahead. And that is how you win this war. Me: Yes I am actually one of those people who threw their TV out and the only way I think it might come back is if there was some kind of integration. Anthony Zuiker: I understand. The second line of thought in that discourse is as follows. The television set is going to need to get with the program. It is going to need to be highly interactive, touch screen, have voice applications, encompass e-mails, encompass the phone, encompass all on-line interactivity, and really be the one stop shop for the living room. if that does not happen then we are going to have to try to make TV the primary device and then go into other ancillary devices and hopefully drive people back to television. It is one of two things. Me: The other question I had is that you really are pioneers, I think as far as I know, in bringing a mainstream broadcast narrative – well there is the L Word and a few others – but what I mean is you didn’t take the VLES (Virtual Lower East Side) route going for a closed world. Anthony Zuiker: Correct. It is very important you said that. Because the L Word – and of course it is part of our family so we want to talk to positively – but there is not a continuous story line in L Word. It really is a one stop shop – a community has taken over that world. It is highly successful for the Electric Sheep and we applaud that. But for CSI: New York we are definitely continuing narrative not only on Oct 24th into world but on February 6th paying it off on the air. And continuing the story line in Second Life beyond February 6th and the sky’s the limit. I believe that at some point it will go so deep that I will start creating original programming inside Second Life – literally like a South Park in Second Life that is original with characters that I create that continues the storyline also. And the possibilities in Second Life are endless much more than First Life. My best example is I can’t sink the Titantic in First Life it is just too much money but I can sink it all day long in Second Life. Me: Yes, I have a background in special effects film and animation and I have been wondering when successful creators from mainstream media like you would look at Second Life and start playing with it. 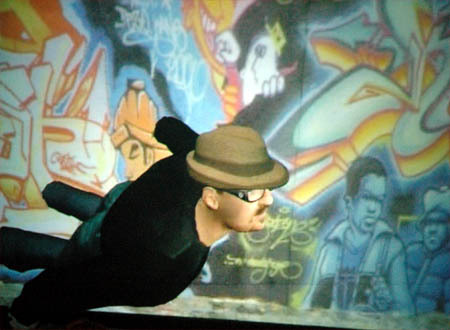 Second Life brings things to the table that have not been there before – a new palette of possibility. Anthony Zuiker: Hopefully in my presentation I was clear that since my background is Las Vegas, since my background is gaming, since I was an only child and I was bored ….what I didn’t say was that I used to role dice and play cards and when I was kid and I was always pretty much a gamer. So when it comes to addressing some of the problems in Second Life in terms of having companies come and write checks to have their products incorporated inside Second Life you now have the narrative creator of the biggest TV show in the world that understands gaming. Me: I have noticed that there are very few professional game developers in Second Life. I think there are a number of reasons for this including a preference for high production values. Anthony Zuiker: Halo 3 is one experience Second Life is another. I understand that. But I believe that all of these devices and all of this content can co-exist. I believe that you can bring top notch gamers into Second Life and make that experience grand. Like I said I’ve launched through the Second Life in the CSI: New York virtual simulation casual games on different levels to make sure the confidence of mass is there. I was very clear to the Electric Sheep I have no interest in dazzling the Second Life veteran. That is not what I am doing. I am trying to get mass here and really create a community that is a lot deeper than 38 to 40, ooo [concurrency] and 9 million membership. Me: That seems to me to be a good analogy when you say South Park in Second Park because that is great entertainment that isn’t based on hi def. Anthony Zuiker: Well unless you were being pelted in the head by Snickers bars you had to have thought to yourself during my speech especially during the 90 second machinima that when I was running after the killer that feels like it could be a show in some way, shape or form. Me: Yes Second Life seems a natural environment for CSI stories! Anthony Zuiker: Here is what is true. Everyone likes a great story. And everyone loves great great characters. And in my business it is character over concept. And in Second Life character and concept have equal footing. Me: How did it all happen? – the connection between the Electric Sheep and Anthony Zuiker that is? Sibley Verbeck: So Anthony Zuiker works at Jerry Bruckheimer Productions – they make the shows and networks pick them up and show them. So in our case we talk to a lot of the networks and work with some of them and someone at CBS said who you should really talk to is Anthony. He is not at our network but he would really understand this and write stories and is always interested in cross platform – not just the promotion of shows but taking the story to cross platform. So it is not just that if you miss the show you can see it on your phone or your ipod – the same show – its lets do something different that’s appropriate for that medium that extends the story that makes sense on an ipod or in this case a virtual worlds. He is passionate about that so then we made that connection. Then we were up an running with the CSI franchise saying: What can we do? How can we make this a great experience? It will be a great experience for the current users of Virtual Worlds including Second Life of course and that is important to us. But more importantly there is even more die-hard fans of CSI. And those people are not currently using virtual worlds so we better have them in mind as well as we design this. So you have done an orientation in Second Life for CSI fans? Yes we have done an orientation, a registration process, we are actually launching an entirely new viewer. So on Oct 24th when this goes on television on CSI we will also be launching a new viewer for Second Life. In this case for CSI, but eventually it will be for lots of other things. Whenever anything is mentioned in CSI people Google it. They go to the CSI website because there are often connections there. So they will go to the CSI website. There they can register for this virtual experience, download the software, come right in and yes immediately they are in an orientation where they are greeted by Anthony’s avatar and they can start getting into Crime Scene related content right away. So they become a Crime Scene Investigator. And they go around the virtual experience and there is a crime and they have help to solve it, look for evidence take it back to the crime lab just like happens in the show. So all these fans will be very familiar with that but here they can interact with it. Most importantly the story continues so there is a story arc that starts with the TV show that continues in the virtual world. It is not just if you like CSI here is the CSI game. Its connected and that story continues then comes back on to TV on February 6th. So you want to be part of that so you know what is going on and then it comes back on TV again. How many people have you got running these avatars to greet people? As works with virtual worlds most of the content is the other people – its the other people coming in. So yes we will have to have a lot of greeters. Because one the things we find in virtual worlds in general and this is not Second Life specific – one of the metrics on whether people are retained and come back is the time between when they log in and when they start talking with someone – of course it is also who they meet. But the shorter that time the more likely they are to stick around. We want to have that great social experience. But it is in large part it is also automated and scaled so that people can come in and hang out with each other then go collaboratively through that experience. What are the obstacles to doing this. It sounds so great. Why hasn’t it been done before? We still look at the obstacles every day! There will be things that work well and things that don’t. This is a first of a kind project for us. We’ll learn and keep on improving this project as it goes on and others after it. And finding people in a different medium who can work together [is a challenge]. We have of course had to film a lot of machinima for the show. We have been working very hard on that. And that was an exercise in merging two different worlds. How TV is shot is just different – with live actors – even though machinima is more like live TV than it is like animation it is still different. And getting those two worlds to talk to each other and working out that production process, of course that was a challenge. So there is challenge with the conceptualization – What should we do? Did you have to rethink gaming for Second Life? When you look at social virtual world in general I think they are a fantastic platform for casual games for example and the casual game market has only been increasing and even larger than the video or deeper game market. So here we have a set of tools that are very flexible, Second Life and other virtual worlds, where you can create a lot of content – whether it is social games, puzzle solving games etc. where it is not running around action games for that you would need virtual world platforms that are also game engines like Icarus or others. 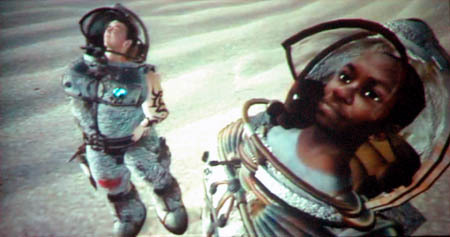 But even in these virtual worlds you can get into this whole great social gaming space that I think is underdeveloped. You have to program for the medium. We are doing some real game mechanics and game elements for the CSI experience. There are some other things we are coming out with here in the very near future for example movie promotions and other things that do involve other types of games for virtual world as well. Here is a photo of the new viewer – an elegant, attractive (great new color scheme! ), intuitive, and simple. But The Sheep have really just reorganized the functions not actually removed any. This is not a castrated browser. And, no they didn’t take building out as some mistakenly have thought. They have just made the most used functions for a mainstream user more accessible and elegantly arranged with mouse over menus. The menus and navigation are more intuitive, for example, there is a back button so you can go back and forward between locations and one for your home. Also the search function is much closer to what you would find in a web browser. You can type an URL into the same location bar you use to hop around SL and the web site will pop up. Web browsing and active html incorporated into Second Life. The new viewer to Second Life incorporates web browsing. I was jumping with joy as I saw Chris Carella demo this. I will be able to happily blog, search, twitter and gmail from within Second Life without missing a beat! No more going out to the web to do things with your machine grinding to a halt. Apparently Linden Lab had embedded a working browser in Second Life a while back but did not release it because Flash was not working yet. The Sheep began working on their new viewer when Linden Lab first open sourced the client. There are some things are still being worked on. 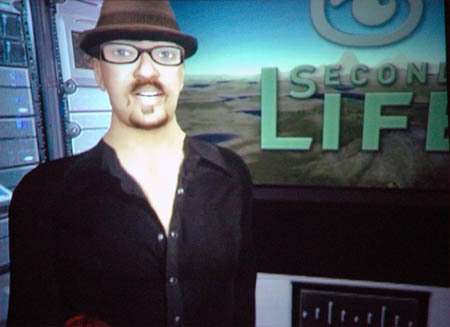 You cannot watch YouTube from inside Second Life yet. There is a detailed description of the viewer on Out To Pasture and sneak preview on New World Notes and more from NWN here. We are well prepared with many sims. We have a lot of islands ready. There will be multiple copies of the same sim for that first day when everyone tries to hit it at the same time. it like sharding in a video game where you get a different server for a different shard but here you will be dropped on a different sim. We are doing load balancing so all sims should stay within thirty or forty people. Paul Steinberg, Intel Software Network and Intel Software Solutions Group sent me this picture yesterday of Tim Mattson (lead of the software development team working on an 80 core test chip). Intel created an 80 core test chip that is running a real application kernel at over one trillion single precision floating point operations per second. In this talk, two developers, Nitin Borkar (the overall leader of the project) and Tim Mattson (lead the software development team), will talk about the project and the lessons it holds for the future of many core chips as well as the compute platform as a whole. What I think is tremendously important, not to be self-serving, is what I know is coming – highly evolved and impactful graphics based on platform innovations from Intel. Obviously, sometimes you want a lightweight presentation but on the whole, people love and respond to a rich environment. 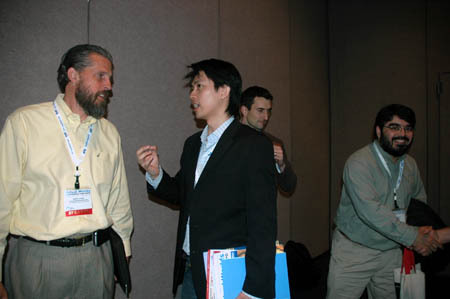 As usual in a conference, some of the best conversations went on in casual settings. Wednesday evening I was thrilled to discuss the business model of the future “50 billion one person enterprises” with Peter Rodriguez, IBM Distinguished Engineer and Manager of the Emerging Technology CIO Office, Tony O’Driscoll from N. Carolina State University who presented on the future of e-learning, and Ian Hughes a speaker for IBM who I have met many times in Second Life as his avatar epredator potato (his blog). IBM had a strong presence at the conference. 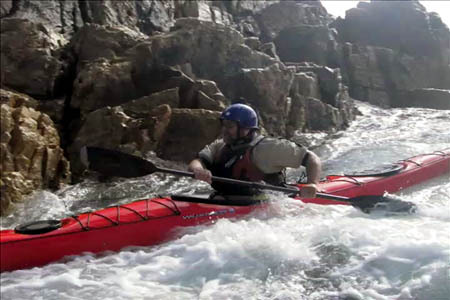 See Ian’s round up here. And I had a very interesting dinner conversation with Christian Renaud, Cisco Systems, Sean E. Kane a New York attorney who spoke on IP Wealth and the Pitfalls of Virtual worlds, Paul Steinberg, Intel Software Network and Intel Software Solutions Group who spoke on creating a user community in Second Life, Professor Robert Bloomfield who is pioneering Metanomics with Metaversed, and Ron Burns of ProtonMedia who had some very interesting things to say about ProtonMedia’s experience using their platform for enterprise diversity training. And then of course there were several chats with “the unstoppable” Ren Reynold’s from Terranova who spoke on his project, “The Virtual Policy Network,” to engage industry, academia and governments in discussions about virtual worlds and public policy. I am pretty sure his amazing blue patent leather Fluevog shoes must be starring somewhere on Flickr by now. Also Wello Horld despite being on “stealth mode” with their project were high profile with their elusiveness! Linden’s were everywhere enjoying themselves even though there were only a few Linden speakers. 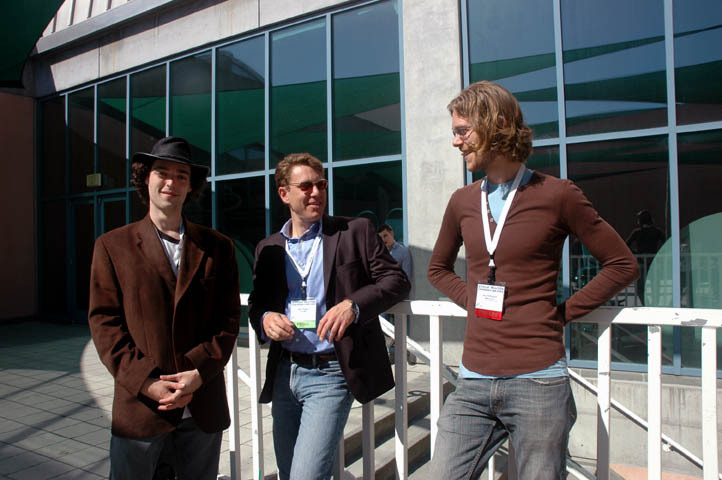 I had some excellent chats with the CEO of Novamente Ben Goetzel on whether venture capital would be antithetical or helpful to the goals of Artificial General Intelligence (see my earlier post on SGI in Second Life here). And I really enjoyed my long conversation with Henrik Bennetsen, formally Henrik Linden and now Research Director, Stanford Humanities Lab. He is author of the blog SL Creativity. 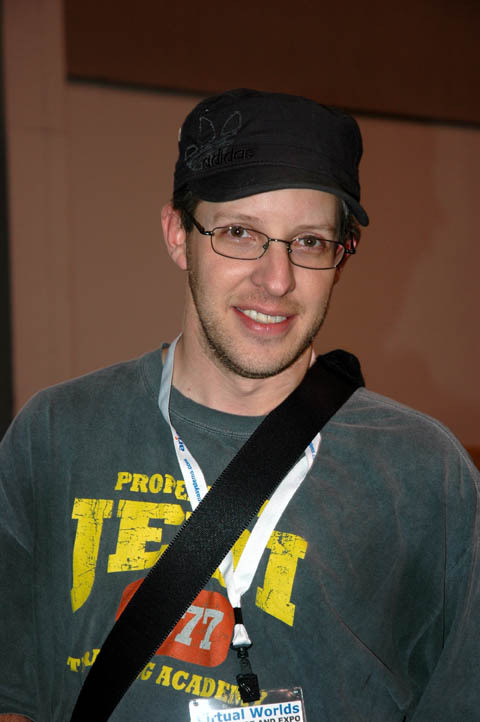 Also it was a real pleasure to meet Adam Hertz (consultant to Mitch Kapor). We talked at length about The Level Playing Field Institute and Freada Kapor Klein’s new book Giving Notice: Why the Best and the Brightest Leave the Workplace and HOW YOU CAN HELP THEM STAY. The top row is Eric Rice, Jerry Paffendorf and Gene Yoon. Second row is Robin, Logan and Philip Linden, then Corey Bridges.